God had a big surprise for the disciples on Easter morning. They came to the tomb and discovered it was empty. Jesus was not there because he had risen! 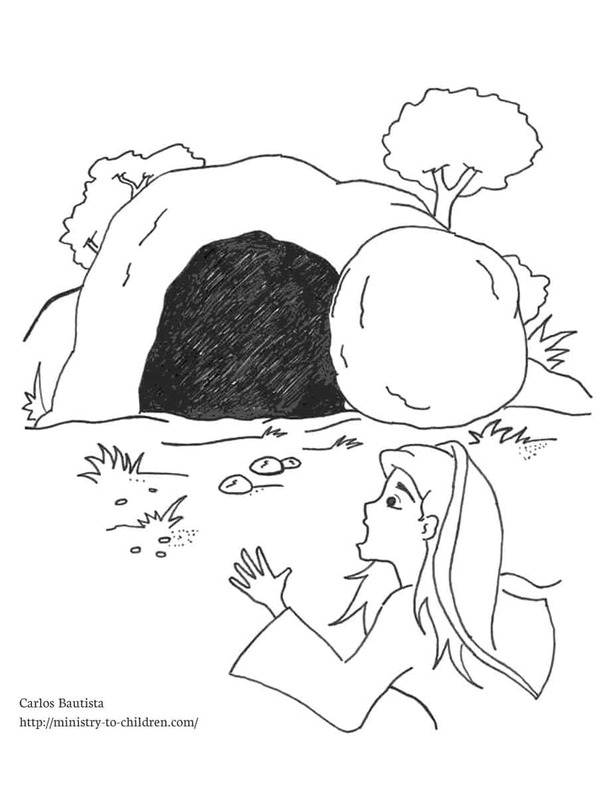 This free empty tomb coloring page shows Mary standing beside the cave. The stone is rolled away and she has a look of shocked joy on her face. Directions: Select the image to the right for the printable version of this coloring page. You can also download this picture as a jpeg file for advanced editing. 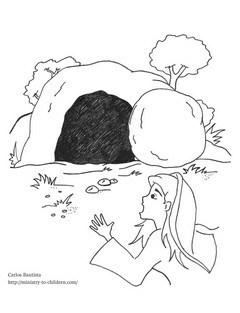 You could use this free coloring sheet with your toddlers or preschool Sunday School on Easter morning. It’s free to copy for any ministry use in your church, home, or school. Here is the link to browse our other coloring pages for Easter. Please leave a comment below to encourage Carlos and thank him for his work. He is from the Philippines and shares his talent with readers from around the world through our website. You can also share how you will be using this coloring picture. Tony Kummer (Editor) reviewed & updated this page on : April 9, 2011 at 1:36 pm. All our content is peer reviewed by our readers, simply leave a comment on any post suggest an update.